The latest addition to Davenport's retail facilities, now open in the former 'Davensport' store at 201 Bramhall Lane. On 24 December, the railway closed down early. Take care to check your evening times: the last train from Manchester Piccadilly to Davenport is the 19:49 (although there may be a later train to Stockport), and the last train to Manchester from Davenport is the 21:08. There are no trains at all on 25 and 26 December. Happy Christmas all. The winter timetables took effect from 15 December. For the Buxton line, the principal change is that departure timings towards revert to the slightly later ones in force outside the leaf-fall season. And were we thinking they just used the back of an envelope. 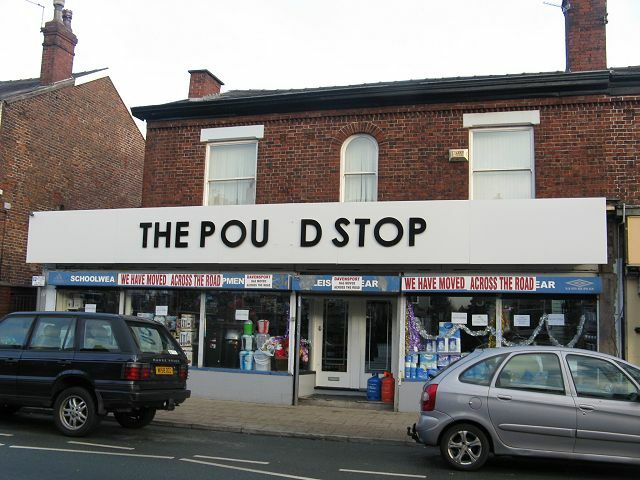 Further to our comments about further uses for empty shops in the area, it is now clear that the former 'Davensport' shop at 201 Bramhall Lane is to be a 'Pound Stop.' A useful facilty perhaps, even if not the sort of shop the late Mrs Mayson of 'Highfield' would have patronised in her shopping trips in the Rolls-Royce. The former 'Best One' premises at 214 Bramhall Lane near the 'Jolly Sailor' are being converted into a branch of 'Cooperative Funeralcare'. On Sunday 7 December (12:30 to 3pm) the Friends of Cale Green Park are having their annual 'Chrismas in the Park' event, with music from Elmfield Brass Band and St George's Handbell Ringers, tea coffee and cakes at 50p per item, carol singing, free hidden Santa contest, raffle, burger van, and - new for this year - a chair-o-place ride. As part of that event, the Friends are going to be collecting rucksacks, sleeping bags, gloves, hats, fleeces, undies, socks and extra food for the Wellspring Rucksack Project. To find out more about the project, visit the website. We have recently completed a new page for our local history collection: 'James Shepherd, Shird Fold and the Power Pulley: Stories of a Davenport house and its namesake. All comments will be very welcome. Trains are always busy in the lead-up to Christmas. For a comfortable journey into Manchester, especially in the mornings, we would advise you to catch a train which has started from Hazel Grove, rather than one which has come from Buxton. The 09:38, 10:38, 11:38 (etc) 12:38 from Davenport are the best trains to get a seat on Mondays - Saturdays. They also call at Oxford Road and Deansgate as well as Piccadilly at no extra cost: the No.2 free 'Metroshuttle' bus from outside Oxford Road station calls at the John Rylands Library stop which is opposite Brazenose Street which is a good place to start a Christmas Market visit. Remember that if you are returning from Manchester on Mondays-Fridays and have an 'off-peak' ticket, the 15:49 train from Piccadilly is the last one until the 18:49 on which these are valid. Travelling in to Manchester the 15:38 from Davenport is the last 'off-peak' train until the 18:37. If you start your journey either way in the 'Peak' you will need an 'Anytime' ticket which is £5.80 return compared to the off-peak fare of £3.30. Also 'Day Saver' and 'Day Ranger' tickets cannot be used on trains in the peak period. On Saturdays and sSundays off-peak tickets are valid all day. Timetables change nationally from 14 December: Northern Rail's are now available to download. On our line, it means that times of trains to Manchester revert to the slightly later times used outside the leaf-fall season. You may also notice that the Saturday 17:21 from Manchester, on which Davenport and Woodsmoor stops were re-instated in October following complaints, reverts to non-stop mode from 21 February. Northern Rail tell us that this is due to a misunderstanding by Network Rail's compilers and the train will continue to stop on Saturdays (only) at Davenport 17:39 and Woodsmoor 17:42. We highly recommend a visit to the Christmas Tree Festival at St George's Church (Bramhall Lane / A6 junction) which runs until Sunday 1 December. Amazing collection of decorated trees by local organisations and residents, plus tea and cake - and if you have not visited before, the interior of the building itself is well work seeing. Full details are on the Church website. An unusual sight at Davenport station on 22 November was a High Speed Train on an excursion from London to Manchester for the Chrismas Markets. 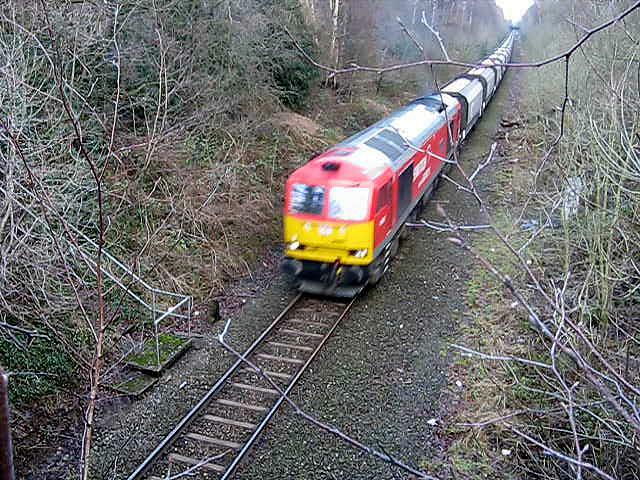 It passed through four times, as it returned to its depot in Derby during the day for servicing, as seen in the picture. 42 more daffodil bulbs were planted at the station on Sunday: hoping for a good display next spring! Thanks are due to the Friends of Cale Green Park for support. Some very good news for Davenport residents is that the Bramhall Lane Spar store re-opened again on 13 November in modernised and enlarged form, now operated directly by the retail arm of James Hall & Co., wholesalers for Spar in the North West. A great relief to those of us who depend on local shopping. Meanwhile, there is activity in the shop near the Jolly Sailor which briefly traded as 'Best One' following the collapse of the Thresher off-licence chain. We await developments with interest. Train drivers working for Northern Rail have voted overwhelmingly for strike action after the failure of the company to make a satisfactory pay offer to members. 82.2% of Northern Rail drivers voted for industrial action; with 17.8% against. Turnout was 82%'- ASLEF press release. We understand that dates of Friday 21 November and Thursday 27 November are proposed, with more dates to be announced. First we have the huge fare rises for afternoon travellers, and now we are threatened with strikes at Christmas shopping time. Let's hope someone sees sense. Network Rail have announced that the 9-month closure of Victoria stop on Manchester Metrolink will now extend over a year, with opening in 'early 2015.' The present modified service, with its altered routes, single-line working and irritating lack of a Piccadilly - Shudehill (for Victoria) direct connection, will continue through the Christmas period. More details. Some better news is that the new line to Manchester Airport via Wythenshawe opens on 3 November. To reach it, passengers will need to change at Cornbrook, as there is limited capacity through the city centre until the new 'second city crossing' line via Cross Street is finished. From 29 October, holders of TfGM Concesionary cards are requested to 'Touch in' and 'Touch Out' their cards at the 'Get me There' readers on Metrolink stations when travelling free of charge after 09:30. This is a pilot project to help the operators test the capacity of the computer system, although it seems that in the final system there will be a penalty fare if you don't. The Hazel Grove Model Railway Society are holding their annual exhbition on Saturday 25 and Sunday 26 October at Hazel Grove Recreation Centre (adjacent to Hazel Grove High School), Jacksons Lane, Hazel Grove. The Greater Manchester Transport Society will be providing a free bus service on both days between Hazel Grove station and the venue. For full details of the show, see www.hgdmrs.org.uk. Show 2: New Findings. Featuring information, stories & images gathered since the last show. Presented by Sue Bailey. Entry £2.50 payable at the door. Bar open at evening slideshows. Councillor Wild reported on incidences of graffiti outside Davenport Railway Station where Network Rail had painted over the graffiti rather than remove it. 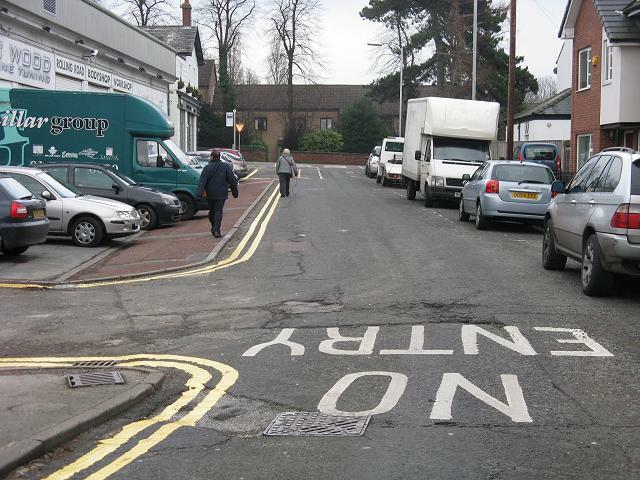 Other Councillors referred to similar cases in other parts of the Borough, and instances where the graffiti had not been removed. 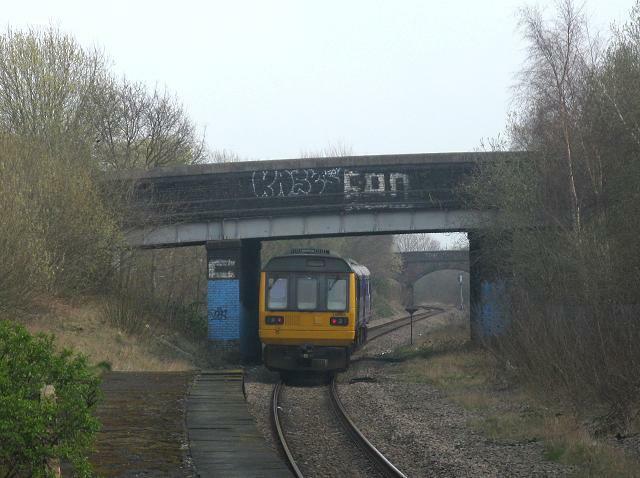 RESOLVED – That the Democratic Services Manager be requested to pursue the issue of graffiti with Network Rail on land which it owned, and invite them to a future meeting of the Area Committee. Not only painting it over (on the car park walkway for example) but painting it over in white on a dark surface. We await developments. A new feature in our local history section: A Tram on the A6, and other stories: transport then and now, with the story of some Buxton Road houses and their residents. Comments are welcome, as always. As usual, the revised 'leaf fall' timetable applies from Sunday 5 October: most services to Manchester are timetabled to depart from Davenport a couple of minutes earlier than usual. Don't miss your train! Also, a reminder that On Saturdays from 11 October the 17:21 Manchester Piccadilly - Buxton train will again be calling at Davenport and Woodsmoor. It's good to see that as promised, work is in progress at the Bramhall Lane Spar store, with re-opening for business expected in the near future. Where's this sleepy village green? at the end of Highfield Close in Davenport. Regarding correspondence on the evening peak restriction being imposed across northern services, local railway union members have been distributing campaign postcards and explaining to passengers at Buxton and Stockport stations that this is only the start of more increased fares and reduction in services which will reduce the numbers of people choosing to use rail services. The DfT through "Rail North" have proposed that the next Northern franchise should be granted with reduced requirements to run early morning and evening service, timetable cuts, Driver only operation, removal of conductors / guards and closure of station booking offices. Passenger service and safety will be worsened by the introduction of these cuts and most passengers will feel more vulnerable travelling without a conductor to offer advice, help and deal with anti-social behaviour on trains. Vulnerable passengers will be particularly affected, those with disabilities, sighting difficulties, lone travellers and people with prams needing help to get on/off trains etc. Passengers do not get the same level of service buying a ticket from a machine, with no advice on onward connections or booking disabled assistance. This campaign is for a safe and well staffed railway and to protect our 25 conductor jobs at Buxton and booking office jobs at New Mills Central and Newtown, Disley and Whaley Bridge for years to come. If readers and station groups want campaign postcards, calling on MPs to sign Early Day Motion 174 to raise their concerns at the proposals for northern rail services, please email stockport@rmt.org.uk. Alternatively you can follow this link to send a message to your MP. It is now confirmed that from 11 October onwards, on Saturdays the 16:23 Preston - Buxton train, which calls at Deansgate 17:12, Oxford Road 17:16 and Manchester Piccadilly 17:21, will recommence calling at Davenport and Woodsmoor. It still misses our stations Mondays - Fridays, but passengers can use the 17:23 Manchester Piccadilly - Chinley on those days. Thanks to everyone who assisted with our campaign to get tbis train re-instated. Already re-instated are the Davenport platform numbers in our station announcements, which had for some reason been replaced by just 'the next train to arrive is...' - not helpful when trains in both directions arrive just one minute apart. We have been trying to understand all the details, confusions and complications, of the introduction of evening peak restrictions but it's proving very difficult. Here are some simple facts as we understand the situation: all apply on Mondays - Fridays only, excluding Bank Holidays. Please let us know of any errors, and also any 'experiences' you have with the new system. 1. People with concession cards ('bus passes') are not affected and can still travel freely all day after 09:30 within Greater Manchester. 2. Holders of 'Wayfarer' tickets are not affected and can still travel free all day after 09:30 in the area covered by the ticket which is much wider that just Greater Manchester. This ticket (£11 adult, £6 children and over 60s) will therefore be the cheapest fare for much of the day to some places, notably Buxton where the 'anytime' return fare from Davenport is £14.50. 3. The 'evening peak' period is defined as 16:01 to 18:29. 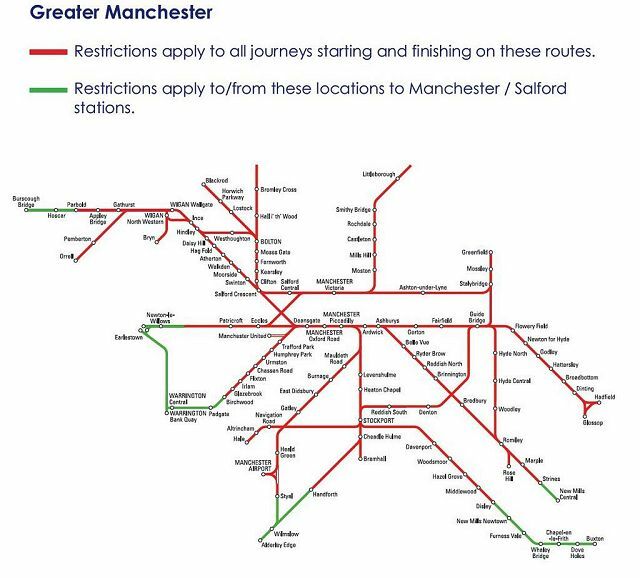 If you wish to board a train in Greater Manchester (and some places beyond) that is scheduled to leave your departure station between these times, an ordinary single or return ticket will have to be a more expensive 'anytime' one. This applies to all journeys, not just those to and from central Manchester. If your journey (in either direction) requires a change of train, then all the trains involved are covered by this restriction. So, for example, if plan to depart Urmston at 15:49 and change at Manchester Oxford Road to the 16:16 to Davenport, you need an 'Anytime' ticket. The map provided by Northern Rail shows lines affected. Despite having asked Northern Rail for an explanation, we still don't fully understand the meaning of the 'green' areas. The wording provided with the map seems muddled, and it is strange that the 'red' area seems to extend to the first station outside Greater Manchester on some lines. 4. The restriction applies to tickets whose price is 'set' by Northern Rail or Transport for Greater Manchester, whichever company's train you actually travel on. So you cannot avoid the restriction by using, for instance, an Arriva Trains Wales service from Manchester to Stockport. However if, for example, you go from Davenport to Liverpool for the day, the fare is set by TransPennine Express, so you can buy a 'off-peak' ticket and on the way home return from Manchester to Davenport on an evening peak Northern Rail service. It is not easy to establish which company sets the fare, except by asking. 5. Holders of Day Rangers and the Train/Bus, Train/Tram and Train/Bus/Tram Day Savers are affected, and cannot use them on evening peak trains. There is no 'peak' alternative version of these tickets, so people making multi-modal expeditions will face siginificant extra costs: a 'Wayfarer' ticket might well be the cheapest solution. The 'evening return' tickets at half-fare and 'evening rangers' are abolished altogether. The weekly, monthly, and annual 'System One' tickets remain valid all day as before. 6. Northern's useful 'Duo' tickets for two people are also affected by the new rules, making them rather less useful. People who travel together often might be interested in the new national 'Two Together' railcard. 7. If you have bought an off-peak return and then decide to travel back in the evening peak, we understand that it will be possible to pay an 'excess fare' of the difference between the two tickets. How this will work in practice remains to be seen. 8. There are sure to be cases where 'splitting' of tickets - buying separate tickets for portions of the journey - will save money, and other situations where it will be cheaper to ask for a ticket to (or from) a station beyond where you are actually travelling. It is not entirely clear whether such options will be allowed, but it seems doubtful. 9. If you are a commuter who has been using off-peak tickets - a part-time afternoon job, for example, a seven-day season ticket could well be a valid option, even if you only travel to work four days in the week, and you can use it for leisure journeys at the weekend too. 10. Be kind to the Northern Rail staff: it's not their idea! 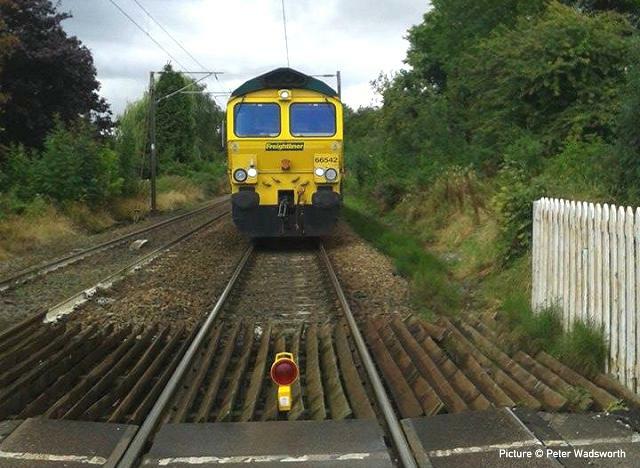 Peter Wadsworth took this unusual picture on 17 August from Woodsmoor level crossing: the barriers were raised because the train of engineers' wagons was stabled on the line from Hazel Grove while the line was closed during track relaying at Stockport. 'System One' - an organisation owned by Transport for Greater Manchester, has published details, in somewhat technical language, of how their tickets will be affected by the changes from 8 September. From 8th September, 2014 Northern Rail will be introducing evening peak restrictions on its services across Greater Manchester. This will mean a restriction on the use of Northern and GMTL off-peak tickets. The restrictions will apply to all journeys, irrespective of direction, departing between 1601 and 1829, Monday – Friday (exc. bank holidays) and also cover other operators’ services on Northern routes. The restriction applies on all Northern Rail services in the 5 PTE areas – there is already such a restriction on Merseyside. The introduction of evening peak restrictions by Northern Rail was one of three options presented to Northern Rail as part of their interim franchise agreement in order to raise revenue (The other options were: across the board ticket price increases or the introduction of car parking charges.). Northern Rail is operating the extended franchise until February 2016, but with a reduced subsidy. Government policy is to reduce taxpayer funding of the railways. It is also hoped that introduction of the restrictions will reduce crowding on evening peak services. TfGM and System One (GMTL) was not party to the negotiations between the DfT and Northern Rail that led to the decision to implement Evening Peak Restrictions. However, TfGM has agreed to assist Northern Rail in the delivery of this plan and we continue to work closely with Northern Rail to address concerns over multi-modal ticketing and communicating these changes to its customers. GMTL day savers: The rail segment of the following types of ticket will be invalid during evening peak, other segments will remain valid: Bus & train day; Tram & train day; Bus, tram & train day. 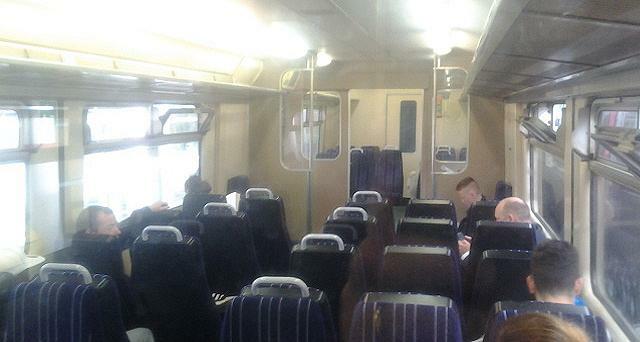 Northern Rail tickets: - Off-peak single; Off-peak returns; Duo ticket; GM Rail Ranger. The changes will not affect the majority of Northern Rail’s passengers who use season tickets and full peak returns. To summarise, they are not happy, but have had no say in the matter. But note that Wayfarer and Concession cards (bus passes) are not affected by the new evening restrictions and may continue to be used at any time after 09:30. How all this will 'raise revenue' to any significant degree is hard to imagine, especially if ticket-checking continues to be as lax as it often is at present. To attempt raise money by targeting people without full-time jobs, and visitors (who probably won't understand the rule) seems extremely unfair. As we reported here and on Twitter, Stockport station was closed on Sunday 17 August with replacement buses running between Hazel Grove and Manchester. As we said, the buses were to pick up passengers at Cale Green Park gates, as is the official procedure confirmed by the station information poster and on the phone by Northern Rail. However, on the day, the buses ran along the A6 and did not take the proper route via Bramhall Lane, Jacksons Lane and Chester Road to Hazel Grove. So anyone waiting at Cale Green as advertised was left behind with no information available. We realised this when the advertised 13:19 bus failed to arrive, and after making our own way to Stockport we raised the matter with the staff there. The people dispatching the buses didn't seem to know what we were talking about, and the Virgin Trains staff ('not our company') would not accept that they could do something on behalf of Northern, so we telephoned Northern Rail - after some delay when we discovered that the phone number printed on all their leaflets is wrong - and told them of the problem, and were told they would investigate. However, still nothing had been done by 6pm as we bowled along the A6 through Great Moor on the way home; information from a bus driver that the dispatchers (employees of FirstGroup) were actually telling the drivers to run along the A6 and not take the proper route as that was 'unsuitable'. This shambles is just one of a series of recent events that seem more characteristic of the dying days of British Rail than a user-friendly private company. Could no Northern manager be persuaded to give up their Sunday drive and keep and eye on things at this busy station? Peak-time evening fare increases (see item below) 'could free up seats for commuters on crowded trains.' 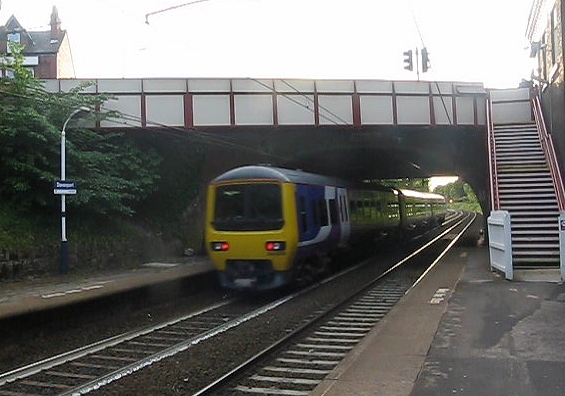 No such shortage of seats is apparent in the 17:23 Manchester - Chinley as it leaves Stockport on 13 August. The details of the plan to restrict the use of off-peak tickets in the evening peak has now been officially issued by Northern Rail. The cost increase for those who have to travel between 16:00 and 18:30 on Mondays to Fridays is dramatic. Day return Davenport to Manchester, for example, increases from £3.30 to 5.80: this applies if either your outward or return journey starts between the above times, so the earliest return journey from Manchester Piccadilly allowed on a £3.30 return ticket after the 15:49 is actually the 18:49. Both these trains are likely to be very full. And the half-price evening returns and evening rangers are being abolished too. If you are coming on a connection train from Salford Crescent, you can't even (in theory?) catch that one as the connection departs Salford Crescent at 18:27. The 15:49 from Manchester (off-peak tickets allowed) to Buxton departs Stockport at 16:02, so you can't get on there with your off-peak ticket! Or indeed at Davenport. This will no doubt be 'spun' as a measure to reduce overcrowding on evening peak trains, but of course its underlying reason is an attempt to reduce the Government subsidy to our train services. Its actual effect, of course, will be to deter some people from using the train, and cause lots of arguments and hassle for passengers and staff. Sunday 10 August, between 10am and 4pm, is the date for the annual Stockport Station Rail Show, which takes place on Stockport station platforms. The event, run by Niki Abnett of Virgin Trains Stockport, this year raises funds for the Stillbirth and Neonatal Death Charity and the Stockport Talking Newspaper Association. The Rail Show is supported by Virgin Trains, DB Shenker and Direct Rail Services. This year there will be stalls, model railways, a grand raffle and visiting diesel locomotives from DB Schenker and DRS. As usual, this has been planed to coincide with a call at Stockport station by a steam-hauled 'North Wales Coast Express' excursion, but it now appears that the 10 August run of this train has been cancelled. However it appears that the train will still run to Holyhead on 3 August (see the Railway Touring Company website). We have taken the decision to operate the store as part of the James Hall & Co. Ltd retail division. Prior to re-opening we plan to modernise the interior of the store to ensure that we offer local residents a great range in a modern shopping environment. Plans are currently being finalised and we hope to re-open the ‘new look’ store in late September. Some positive news is certainly needed. Davenport's shopping area has been looking more and more like a boarded-up wasteland of late. That shop has an interesting history. It has been leased by the property arm of James Hall & Co. since 1987, but there has been a grocer's in that location since the building was converted from houses some time around 1903. It was originally part of a chain of high-class grocery shops in our area founded by Ebenezer John Williams, who lived in Davenport, in the large house 'Broadfield' on Egerton Road. Several of his sons, who became partners in the business, lived nearby. 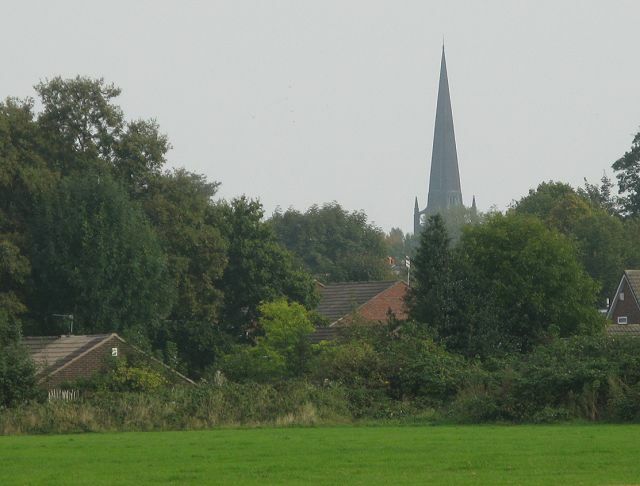 The Friends of Mirrlees Fields is holding a tidying-up event on Sunday 13 July from 10am to 3pm and is looking for volunteers. Details are in this PDF file. How this blunder, leaving an hour's gap in our service at a busy time, came about, and why it cannot be corrected immediately by reverting to the previous times, 'they' have yet to explain, especially since the train is currently timetabled to wait three minutes at Hazel Grove, and to arrive at Buxton at 18:24, exactly the same arrival time as when it did stop at Davenport and Woodsmoor on Saturdays until 17 May. 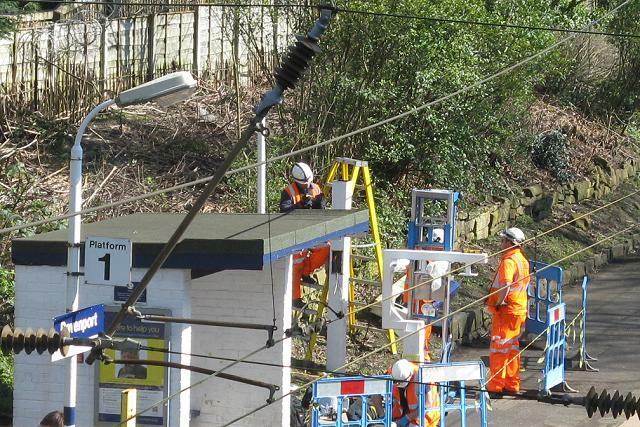 Also note that at weekends from 5 July, and every day from 19 July to 31 August, trains to and from our line will not serve stations beyond Bolton, as the line is closed at Chorley for works connected with electrification. Timings on our line will not change. There's a summer event in Cale Green Park on Sunday 29 June from 13:00 to 16:30, including refreshments, craft stalls, music, clog dancing and a birds of prey display. Admission is free. See the Friends of Cale Green Park website for full details. Until the recent timetable change, the 16:23 Preston to Buxton train, which departs Manchester Piccadilly 17:22, called, on Saturdays Only, at Davenport and Woodsmoor, whilst omitting these stations Monday - Friday. Now it also omits the stops on Saturday, a day on which the 17:23 Manchester Piccadilly to Chinley, which serves Davenport and Woodsmoor Mondays - Fridays, does not run. The result is a one-hour gap (16:49 to 17:49) in service from Manchester to Davenport just at the busy time on a Saturday when people want to return home from shopping, sporting events, and so on - even from work. I'd be very interested to know why the changes to stops of the Buxton train have been made, at considerable inconvenience to passengers, yet with little or no difference to the advertised running times between Stockport and Hazel Grove. I'd also like to know who made the decision: was it TfGM, Northern, or Network Rail, and who was consulted about this annoying change. If not Northern Rail, who should I be raising this matter with in the hope of changing back to the previous situation? Should anyone feel able to also write regarding this to customer.relations@northernrail.org it would help to raise the profile of the matter. A mildly disappointing aspect of the timetable change is that the famous weekly train from Stockport to Stalybridge which runs on Fridays only has had its departure time from Stockport re-timed from 10:13 to 09:22, meaning that people will not be able to reach it so easily, and cheap day tickets and concession passes are not valid as it is before 09:30. The train is traditionally formed by a diversion via Stalybridge an empty-stock train which actually runs every weekday from Manchester Piccadilly to Newton Heath depot, reversing at Stockport. Now, however, for some reason (lack of a path, perhaps) the train runs empty via Styal to Wilmslow and reverses there, calling at platform 3 at Stockport where it cannot stand waiting as it previously did in bay platform 3a. Since 2008 the electric overhead wires, brought into use on the Stockport - Hazel Grove line in 1981, have been almost unused, with just one token Monday - Friday train worked by a Class 323 electric unit: the 19:22 Manchester Piccadilly - Hazel Grove, which then returned empty to Stockport carriage depot for overnight cleaning. Our picture shows the last run of the 20:04 Hazel Grove - Stockport empty coaching stock train, running 10 minutes early, passing Davenport. In the new timetable, the service at this time is provided by a diesel as it runs through from Preston on the un-electrified route through Bolton. Network Rail's current electrification programme includes the Manchester - Preston line, to be complete by December 2016: at that point we can expect that electric trains will re-appear, on the regular Hazel Grove - Preston service. It is to be hoped that the overhead equipment does not deteriorate in the meantime. Jim Gilligan, of the Friends of Mirrlees Fields, writes: 'With our partners, Cheshire Wildlife Trust, we shall soon start work on improving the access pathway to the Mirrlees Fields adjacent to Fred Perry Way. The bulk of this work will take place on Wednesday 21, Thursday 22 and Friday 23 May, starting at around 9am each morning. Use of 'Social Media' is very fashionable with train companies, including our very own Northern Rail (twitter.com/northernrailorg) and can be useful for general information, complaints, and so on, but there is a tendency to also use Twitter to issue bulletins about specific train running. Rembember, though, that the information on the Twitter feed is manually input, and data about individual trains may well be missed. For example, the 19:52 Manchester to Buxton on 16 May ran over 40 minutes late, but this was never 'Tweeted' even though Tweeting hours are said to be '0630-2030 Mon-Fri, 0800-2000 Sat & 0900-1700 Sun.' Far better (in our opinion) to use the Railway's automatic systems if you want to check a particular service: there is an Application available for Mobile Devices or you can simply use the text service, e.g. text DVN to 84950 for the next trains at Davenport. You can 'follow' Charlie Hulme's thoughts about Davenport (and anything else that comes to mind) at twitter.com/altfelden. 2014 events are scheduled for 29 June (summer event) and 7 December (Christmas event). They are free for everyone, but money is needed for all the entertainment - magician, generators, bands, face painter, competition prizes, tea room consumables, rides, etc. Every contribution will make a real difference. This year's summer timetable change, from 18 May (Download the leaflet here), sees a number of alterations to the times of trains on the Manchester to Hazel Grove and Buxton line. The underlying pattern remains the same, but there are changes to the exact timings. Below are some general comments, although there may be other changes we haven't noticed. Towards Manchester, on Mondays to Saturdays, the general rule outside the morning peak is that trains originating is Buxton depart Davenport at 07 or 08 minutes past the hour until 22:08 then 23:36, and will run non-stop from Stockport to Manchester Piccadilly. Trains originating from Hazel Grove will depart Davenport at 39 or 40 minutes past (the last at 18:39) and call at all stations, including Heaton Chapel and Levenshulme, to Salford Crescent before proceeding to stations beyond. The current anomaly of two trains (14:05 and 16:35) leaving earlier than normal to ensure that people miss them has finally been ironed out, although why there are still variations of a minute is anyone's guess: the result of preparing timetables by computer, presumably. Timings are still painfully slow: almost all trains, whether or not they call at Heaton Chapel or Levenshulme, are allowed 15 minutes for the 6-mile journey from Stockport to Manchester Piccadilly, an average of just 24 miles per hour. From Manchester Piccadilly (with variations in the peaks) departures are at 21 minutes past for trains running through from Salford Crescent and beyond, and 49 minutes past (until 21:49, then 23:10) from trains starting from Manchester Piccadilly. Nearly all trains call at Heaton Chapel and Levenshulme. The 19:21 (Mon-Fri only) Manchester - Hazel Grove, which currently starts from Piccadilly, will come through from Preston, meaning that it can no longer be the one 'token' electrically-powered train of the day and must be worked by a diesel. Whether another train gets this honour remains to be seen. Departures from Davenport towards Buxton are generally earlier than now at 05 minutes past. On Sundays, the barely-adequate hourly Buxton service, with slightly earlier timings, is again augmented by two-hourly trains between Hazel Grove and Southport, some of which, especially in the evenings, are very useful as they do offer a service from Oxford Road. However it is disappointing to see that the Transport for Greater Manchester planners persist in omitting stops at Middlewood station on several trains, leaving two-hour gaps in the services for walkers and cyclists to the pleasant countryside of the Middlewood Way. Our attempts to get this changed back to the previous hourly call have resulted in condescending and/or arrogant replies from Transport for Greater Manchester Officers and TfGM Committee councillors, but we have not given up. The purported reason is shorter journey times to/from Buxton, but a glance of the timetable shows that in practice this is factor is hardly noticeable. Until 2012 Sunday trains called at all stations, and we do not see why there was any need to change it. The Northern Rail franchise, due to expire this year, will continue to be held by the present Netherlands State Railway / Serco consortium for a further 22 Months until February 2016, it has been announced by the Department for Transport. You can watch a video of Mr Hynes, the Managing Director (whose accent reveals that he grew up not so far from here) explaining some of what will be happening. Included is some bad news for many: there are to be 'evening peak restrictions' on the use of Cheap Day Return tickets. If implemented this will greatly reduce the attractiveness of train travel for many people. Also announced recently is that Northern will be getting 14 more electric trains over the next couple of years for use on the lines currently in process of electrification and planned. Typically these will not be new, but hand-me-downs from the London area, built at about the same time as our present diesels, and much like the Class 150 'sprinters' in general appearance. According to the current plans, regular electric trains will come back to Hazel Grove at the end of 2016, when electrification of the Manchester - Preston line is completed and the Hazel Grove - Preston service will be run by electric trains. Since 2008, just one train per day - the 19:21 Manchester Piccadilly to Hazel Grove which then returns empty to Stockport carriage depot - makes use of the electric wiring to Hazel Grove installed at considerable expense back in 1980. Replacement information screens being installed, 2 April. On the banking, there are signs that inroads have finally been made into the Japanese Knotweed infestation. Thank you for your concern regarding this Spar Store. We have spoken to James Hall & Co. and they have informed us that there has been a complication with the transfer of the sale of the business which will, hopefully, be resolved as soon as possible. James Hall & Company, based near Preston, are the distributors for all the Spar stores in the North of England. The well-known, and absurd, once-weekly 'ghost' train service from Stockport to Stalybridge will be a 'Folk Train' on Good Friday 14 April. Normal train fares apply. Resident musicians Ged & Phil plus expected guest musicians, will be providing the Folk Music entertainment on the train and in the equally-famous Stalybridge Station Buffet bar. The train departs Stockport 10:13, Reddish South 10:20 and Denton 10:25. Passengers will need to return via Manchester Piccadilly as there is no direct return service. See also the Friends of Reddish South station website. 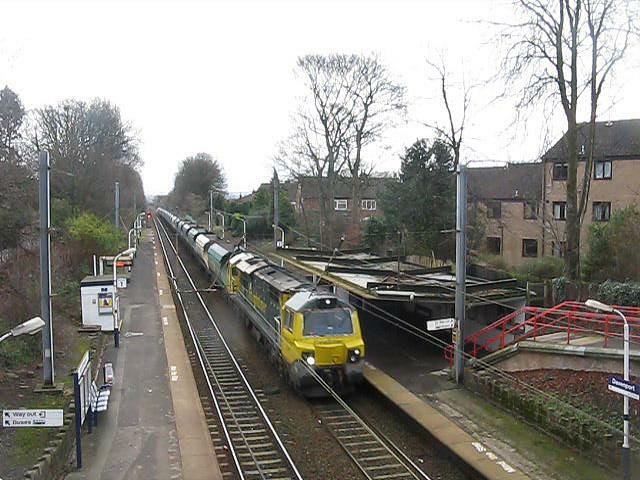 Our picture shows the train departing from Reddish South on 28 March. This looks like some remote country branch, and indeed it is very convenient for access to Reddish Vale Country Park. However, it does serve a residential area, and there is a large Morrisons store right next to the station. The long-term aim of the Friends group is the establishment of a regular service between Stockport and Manchester Victoria which could run this way. Incidentally, although a 'Friends of Davenport Station' group was formed some time ago, it has had trouble generating interest among the Davenport Community. This site is not organised by the Friends as such, but if anyone is interested in helping to run a group we can put you in touch with the Chairman. By popular demand, Sue Bailey and Roger Sim will be giving a repeat performance of their slide show on the history of Woodsmoor on Friday 21 March at the tennis club pavilion, Flowery Field, starting at 7.30pm. We strongly recommend this to anyone who missed this the first time round: anyone interested in local history is sure to learn something: we certainly did, including the reason why the new house under construction in Flowery Field is called Walmsley House ... but the origin of the naming of this former peat moor after 'Woods' still eludes researchers. There has been a change to the planned operation of the 'Buxton Spa Express' on 15 March. The diesel loco will now take over the train, which will have arrived at Buxton behind the steam loco via the Hope Valley line and Peak Forest, will now leave Buxton at 15:15 and run via Romiley and Denton to Stockport (Pass 17:07) and on towards London. The steam loco and its support coach, destined for the East Lancashire Railway, will run as a separate train. departing Buxton at 16:00 and passing Davenport about 16:50. Anyone wishing to travel on a main line steam special should note that the Railway Touring company has some North Wales Coast Express trips planned for the summer, which will be picking up at Stockport on Sundays 3rd and 10th August and 7th September. A new development in the National Rail fares scheme started on 3 March with the full launch of the 'Two Together' Railcard after a trial period when it was sold only to West Midlands Residents. This card, which will cost £30 a year from Ticket Offices or £27 on-line, is for use by two named people (always the same two, photos required) travelling together by rail at off-peak times (i.e. not before 09:30 Mondays - Fridays) and offers 33% discount for both people on all the usual range of single and return tickets, both standard and first class. Both people have to be over 16. It will be possible to have more than one of these cards, or one in addition to a Senior or other card, although of course the discounts are not cumulative. For more details, visit the Two Together Website; there are many scenarios that can be envisaged where calculations will be needed to find the cheapest fare option, but generally it seems a good idea. Perhaps one day Britain will follow Germany and offer a card, perhaps at a higher subscription, which even a single adult under retirement age can buy. A Postcard from Davenport No.5: Bramhall Lane and Frewland Avenue, compares some old postcards with the present-day scene, and adds a little historical detail. New Mills and District Railway Modellers present their annual Exhibition at Chapel-en-le-Frith High School, Long Lane, Chapel-en-le-Frith on Saturday 22 February (10:00 - 17:00) and Sunday 23 February (10:00 - 16:30). Admission: Adults £5.00, Concessions £4.00, Family (2+2) £12.00. Over 20 layouts, plus displays and trade stands. We recommend travelling to the show by train: the journey is rathher scenic, and the scholl is easily reached from Chapel station by walking down the lane towars the town, about half a mile. The off-peak return fare (valid all day at weekends) is £7.70; two people travelling together can use a 'Duo' ticket for only £11.50. If you already have a Greater Manchester pass or traincard you can ask for a Middlewood - Chapel ticket which is cheaper. The Mirrlees Fields Friends Group is offering a History Project Slide show in the Davenport Tennis Club Pavilion, Flowery Field, on Friday 28 February. Sue Bailey and Roger Sim will be showing images of old Woodsmoor and telling a few of the stories that will go into the Woodsmoor History booklet they’re hoping to publish this summer. They have a wealth of information from their researches into old archives and from peoples’ memories, photographs and drawings which have been collated over the past couple of years. Admission will be £1 on the door, the show starts at 2.00pm and is then repeated at 7.30pm - there will be tea and biscuits afterwards. the first season and is then cut back to encourage growth during the next season. for up to 30 years before re-planting becomes necessary. improvement purposes and which are suitable for the permanent deposit to land. This looks very much like the proposal for a disposal site for building waste that has caused concern among residents in the Adswood Road area who would be affected by the additional vehicles using the entrance adjacent to the current recycling facility. It will be interesting to see how this application proceeds. Buxton line trains are running almost normally this morning (Thursday 13 February) after the gales of the previous evening, which blocked the line near Whaley Bridge for a while and also affected Stockport - Manchester. Rail staff did a good job in keeping some trains running on our line: the electrified lines to Macclesfield and Crewe ceased operation completely due to overhead line damage. 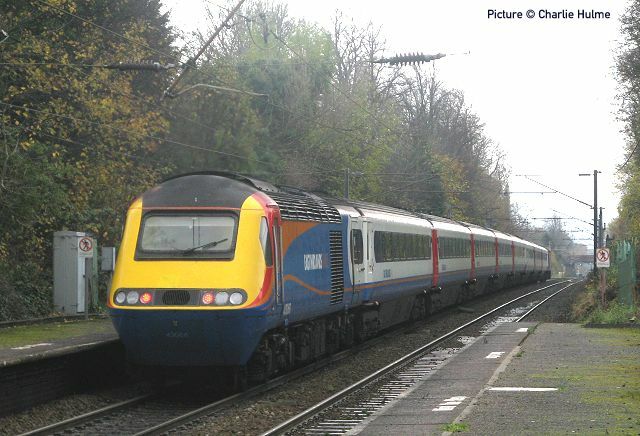 Two trains were stranded near Congleton for four hours. There is still overhead line damage on the slow line serving Heaton Chapel and Levenshulme stations, and trains to Manchester are unable to call there (information at 08:00). The 'Spar' supermarket on Bramhall Lane was found to be 'closed until further notice' on 11 February for reasons unexplained. The J.W. Sutherland Photographic collection, which includes many pictures of local railway scenes, has now been expanded to include the late Mr Sutherland's black-and-white pictures as well as his colour slides. 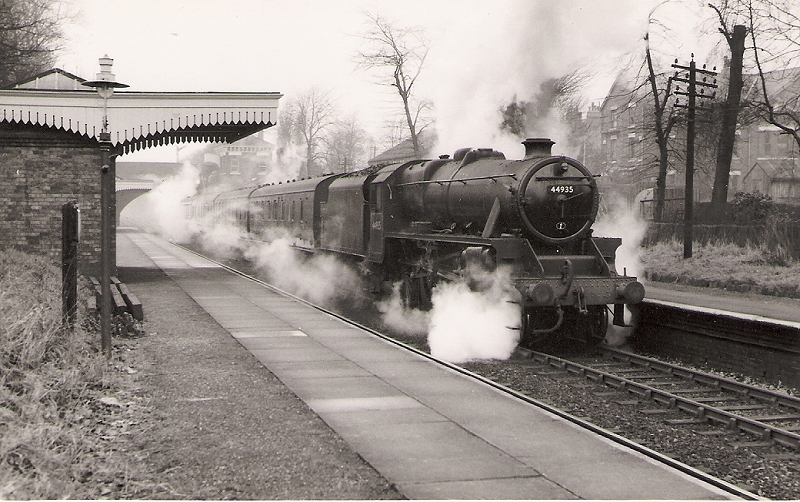 Above: 'Black 5' locomotive 44935 on the 12.50pm (Saturdays only) Manchester - Buxton, February 1958. Steam was only used on rush-hour extras by that date; many people still had to work on Saturdays until lunchtime. Note the gas lamp and the extra platform shelter, now vanished without trace. Our thanks again to Mrs Sutherland for permitting us to offer this marvellous collection online. A locomotive type not often seen at Davenport station: General Electric-built 70 003 in charge of a transfer of wagons from Eggborough power station in Yorkshire to Freightliner's base at Guide Bridge on 3 February. 'D for Davenport station' is the 5 February feature (apparently it's 'ABC Wednesday') on the very interesting Stockport Daily Photo site, which is well worth a visit. Pedestrians will hopefully be pleased to see that the double yellow lines on Oakfield Road, implemented back in 1991 (letter sent to residents at that time) to deter vehicle owners from blocking the red pavement installed at that time to give the garages use of the former pavement behind, have now been repainted, having vanished after years of lack of maintenance, leading to widespear disregard of the restriction. Let us hope they are now obeyed. On the very murky afternoon of Sunday 26 January, DB Schenker locomotive 60 007 passes under Bramhall Lane with the regular stone train from Tunstead to the chemical complex at Oakleigh Sidings near Northwich, which has been a regular sight here in various guises since the 1930s. We understand that the Winnington soda ash plant, once Brunner Mond, ICI and now, like so much of Britain's heavy industry, owned by the Tata group of India, is closing very soon due to 'rising energy costs' and this train will run no more after 2 February. We also have a YouTube video featuring this train and others. Looking at this single-track byway now, it is hard to recall that until the later 1960s, many London expresses, including the 'Midland Pullman' hurried under this bridge on the double-track main line opened by the Midland Railway in 1902. Local historians may be interested in our new Document Archive which currently had downloadable directors for Stockport dated 1896, 1910 and 1914, offering an interesting picture of life in our area a century ago. Everyone is welcome to download copies of the documents: more will be added in due course. Northern Rail report: 'Stopping train services between Manchester Piccadilly and Sheffield [va New Mills Central are continuing to be disrupted following a vehicle hitting a bridge near Strines on Thursday afternoon 23 January. The collision caused damage to the masonry which needs to be stabilised and repaired. [From Monday 27 January, our Sheffield to Manchester Piccadilly services will run as scheduled but services from Manchester Piccadilly to Sheffield will be diverted via Stockport with Chinley as the first stop. Note that this will not affect the Manchester - Sheffield express service, which runs via Stockport and does not pass through Strines. The diverted stopping trains may be noticed passing through Davenport, and we can expect trains calling at New Mills Newtown to be busier than usual as people avoid using the bus replacement from New Mills Central. I was a bad morning on our railway on 23 January with 'signalling problems' due to a power failure between Stockport and Manchester which began just after 08:30. The train from Alderley Edge which left Stockport at 08:35 was trapped for nearly two hours and did not reach Manchester until 10:35. Many other trains were diverted or cancelled, and services from Buxton and Chester were being turned back at Stockport. The fault appears to have been repaired about 10:30, but with continuing disruption due to trains being in the wrong places to form ther scheduled services. 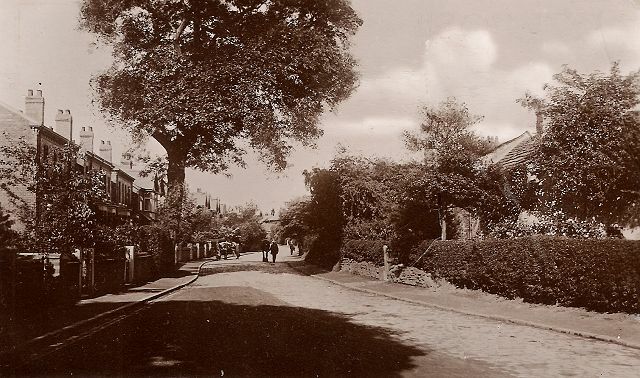 There's a new feature on our History pages tracing the life and times of Bamford Grange, the house which once stood on the site in Adswood of the the present-daty care home of the same name, with its blue plaque to Edwardian starlet Gabrielle Ray. We'd be very interested to hear from anyone who can add to the story with personal memories. Crossing the road to get to the station from the 'Convenience Shop' corner can be a wearying experience. 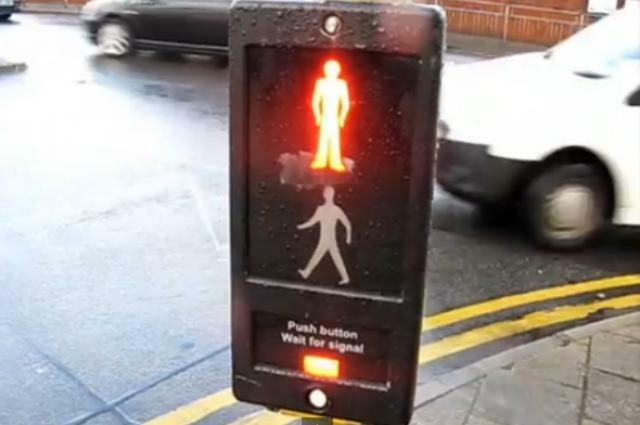 After waiting at the Garners Lane crossing for the 'green man' to get to the triangular island, you will often find that (unless you are Usain Bolt) the Bramhall Lane crossing has already changed from green man to red just before you reach it and you have to wait all over again. Frustrating. We've made a Youtube video of a typical wait, by way of a cry for help. As usual at the start of the year, train fares have been increased. Here are some samples of the new fares from Davenport. Note that the 'cheap evening return fares' which apply between all stations shown on Northern Rail's evening map (PDF download) including Davenport and Manchester, when travelling outward between 18:30 and 21:00, are half the price of an off-peak day return - cheaper than a single journey ticket. 'Off Peak' return fares cover return on any train the same day. On local journeys there are no return tickets valid for return on a later date. You must buy a single ticket for each direction. other times: single £3.20 day return £3.30. Tickets to 'Manchester Central Zone' are valid to Piccadilly, Oxford Road, and Deansgate, and can also be used to travel on the Metrolink tram between Piccadilly, Victoria and Deansgate-Castlefield. If you want to go to Salford Crescent, you need to ask, but the fare is the same. To Stockport: Before 09:30 Mondays - Fridays Day single £1.60 return £2.40. Off-peak, i.e. other times: single £1.50, day return £1.60. A free bus service operates during daytime hours between Stockport station and the shopping areas of the town. There are a number of ways to save money on journeys to places other than Stockport and Manchester, such as Greater Manchester Day Rangers, accompanied child fares, and 'Duo' tickets for two people travelling together. Station staff will be happy to advise on your particular journey. This page from Transport for Greater Manchester offers some ideas.